Has the United Kingdom started to reduce inequality? Spoiler: Not yet. Inequality in the UK is projected to rise in the coming years. A historically low unemployment rate means that more households are earning a living from the labour market. At the same time, tax changes and social security cuts introduced since 2012 have had a particularly severe effect on people on lower incomes. Black and ethnic minority households, families with at least one disabled member, and lone parents (who are overwhelmingly women) have suffered disproportionately. The UK is well known for its strong legislation on equalities. The Equality Act 2010 was a significant contribution in this regard. However, eight years since its adoption, the Act has not yet been implemented in full. Successive governments have failed to bring into effect the socio-economic duty, which requires public authorities to have due regard to the desirability of reducing material inequality. 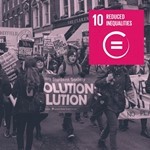 In the United Kingdom, a consultation process coordinated by the UK network of Stakeholders for Sustainable Development (UKSSD) concludes that “inequality is projected to rise in the coming years”. Paradoxically, the unemployment rate is reaching an historical low, but “at the same time, tax and social security cuts introduced since 2012 have had a particularly severe effect on people on lower incomes. Black and ethnic minority households, families with at least one disabled member, and lone parents (who are overwhelmingly women) have suffered disproportionately”. A member of the network, Just Fair, led the drafting of the civil society chapter on SDG 10 on the reduction of inequality at the national level and highlights the fact that, thanks to the Equality Act of 2010, “authorities gather and transparently report useful disaggregated data”. Yet, successive governments have failed to implement this Act. The duty is in force in Scotland since April 2018, Wales has the power to follow suit, some councils are voluntarily implementing it and 78 Members of Parliament from five different parties are calling on the government to bring the duty into effect. The present and future of economic and social rights in the UK will depend considerably on the legal and policy consequences of the UK’s withdrawal from the European Union. In recent years, the UK has introduced significant changes to its welfare state with the Welfare Reform Act 2012 and the Welfare Reform and Work Act 2016. The reforms were justified on two grounds: deficit reduction and ending welfare dependency by facilitating access to work. LONDON, Mar 15 (IPS) - A majority of British MPs have signed up for a resolution to make poverty history -- but not voted to take action on it. Their support comes through a parliamentary resolution that does not arise from within the parliament chamber. It comes by way of signing up to what is known as an Early Day Motion (EDM). Copies of the motion are placed in the House of Commons for MPs to sign up to, in the knowledge that these are not likely to be debated within Parliament. No EDM this year has drawn as much support as EDM number 9 tabled by Labour MP Julia Drown. One fourth of the British households are poor and the north-south divide is getting wider, claim British researchers. 2018 - Has the United Kingdom started to reduce inequality? Spoiler: Not yet.